 Protect Your Chimney Against Harmful Moisture! Water can be one of the most damaging forces your masonry chimney encounters. In as little as one season, water damage can cause masonry to crack, spall and fall away. Because of this, homeowners should take a proactive approach to protecting their chimneys against water damage. Although masonry is designed to withstand the elements, water can still be extremely damaging to bricks and mortar. While healthy masonry can withstand years of rain, sleet and ice, damaged bricks can quickly deteriorate. During the freeze/thaw process, water is absorbed into small cracks and holes in the brick. If allowed to freeze, this water expands and causes larger and larger holes and cracks to form. Eventually, the freeze/thaw process can cause bricks to spall and fall away from the chimney structure. In addition to the damage done to the masonry itself, damaged bricks are more likely to let water into the chimney, causing leaks and creating damage throughout the chimney system. The presence of water in your chimney can be harmful to many parts of the chimney system. While the exterior of the chimney is meant to withstand water, the interior is not. We’ve seen water cause serious damage to the flue, damper, firebox and other parts of the chimney and fireplace. However, this type of water damage can almost always be prevented through good chimney maintenance. One of the best things you can do to prevent water damage to your chimney is have the masonry waterproofed. During the waterproofing process, sealants specially designed for use on masonry are applied to the entire chimney structure. Unlike paint, which seals both water and gas into the bricks, chimney waterproofing sealers allow the brick to retain its permeable qualities. This lets gas pass through and water and moisture currently in the bricks evaporate, all while preventing new water from getting in. Even if your masonry has already begun to show signs of water damage, the waterproofing process can be beneficial! When used on chimneys with existing water damage to the masonry, waterproofing has been shown to significantly slow or completely stop the water damage process. This can not only extend the life of your masonry, but can also help prevent costly repairs and restoration down the road. Have Your Chimney Waterproofed Today! Whether your chimney has already begun to show signs of water damage or you merely want to proactively prevent it, waterproofing is an excellent way to extend the life of your masonry chimney. 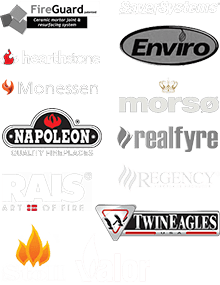 Call Olde Towne Chimney & Fireplace Sales at 812-284-0123 or click here to schedule your waterproofing appointment! Find out if damaged or missing flashing is causing your chimney leak before more damage can occur. Call us now for an appointment.